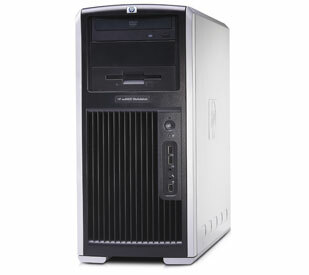 HP xw8400 workstation computer is a high performance system for small and medium businesses. HP xw8400 features dual-core Intel Xeon Processor 5000 Sequence or 5100 Sequence and runs on Red Hat Enterprise Linux or genuine Microsoft Windows XP Professional SP2, both 32-bit or 64-bit depending on OS choice. HP xw8400 supports up to 64 GB memory, SATA hard disk, dual layer DVD re-writable optical drive with LightScribe, integrated High Definition audio with Jack Retasking technology, NVIDIA Quadro graphics card, Gigabit Ethernet, PCIe slot, IEEE 1394 FireWire ports, USB 2.0 ports, and comes with 800 watts wide-ranging, active Power Factor Correction. Cadalyst (dead link) reviews HP xw8400 Workstation and highly recommends the HP workstation with comment that although the higher price tag would ordinarily preclude the xw8400 from receiving Cadalyst’s Highly Recommended rating, the stellar AutoCAD performance proved to be the determining factor here, so the HP xw8400 earns the Highly Recommended rating. Good points been extremely fast and extremely quiet plus many configuration options, while it’s a little pricey.